Get Customized Digital Signage in Less Than Five Minutes! One of the easiest ways to get started with Rise Vision’s free digital signage software is using a template. Templates are included with any paid plan, but can also be purchased separately. Many of the templates can be used with no customization, but some require a little bit of tweaking. In this post, I’ll show you just how easy it is to customize a template to your school’s branding--and by easy, it can be done in less than five minutes! 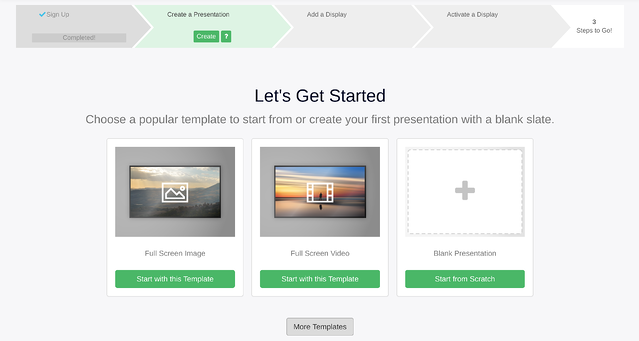 To get started, sign-in to your account, and click “Create a Presentation.” From here, look through the dozens of templates, and pick the template that’s best for you (you can also search for templates). From here, customizing is a breeze! Let’s change the logo first. Click on the logo placeholder to get started. Notice how everything darkens but the placeholder? That helps you see what area of the digital display software that you are currently using. There are a few ways to add an image. The easiest way is to use the cloud storage within the digital display software; this method is very similar to getting an image off a USB Drive or your hard drive. 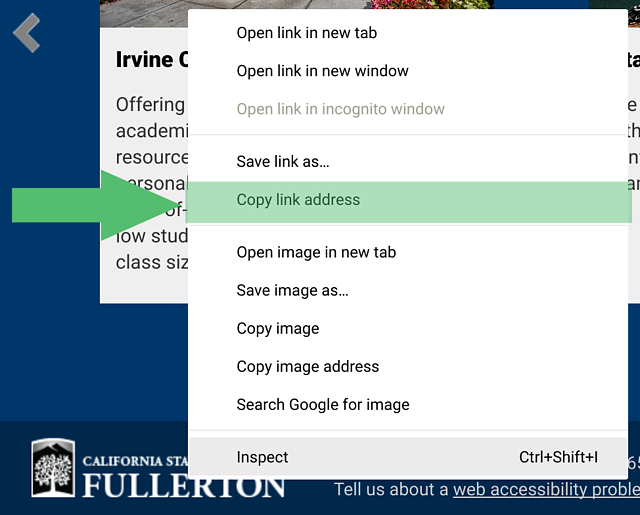 If you already have the image on a website and prefer to use this method, then click on the “Custom URL” option. Now just paste the URL into the URL bar in the digital display software and then hit “Save.” Your image should now be updated with the new logo. 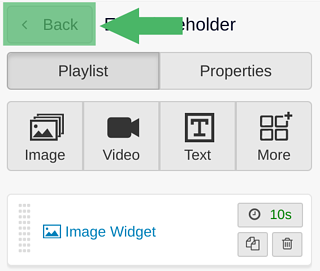 To return to your other placeholders, click on the grey “Back” button on the left side of your presentation. Next, let’s change the background. Click the config button near the top of the screen. There’s a lot of different options to pick from. 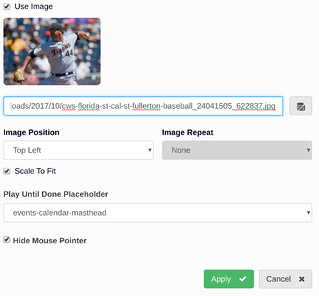 You can select an image or a color; if you select an image, you can choose the placement of the image. You can also use a Custom URL using the same method as I did for the logo. One thing to keep in mind with Custom URL’s is if the image URL changes or is deleted from the web host, then you would get an error message on your digital display. Using the cloud storage option is the best way to ensure your digital display signage does not have any errors in the future. Next, let’s change the calendar so the default calendar is replaced with our custom calendar. You’ll need to use Google Calendar to do this (don’t worry, it’s free!). 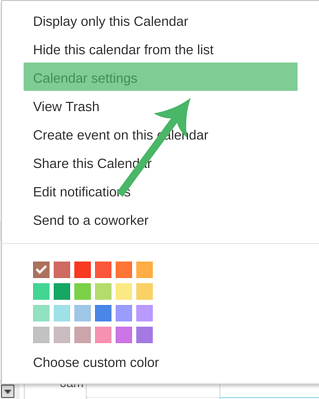 To get started, click the “Calendar” placeholder, then click “Google Calendar” in the left menu pane. This brings up the calendar settings. In the Calendar ID box, add the ID to your calendar. You can get this ID by going to Google Calendar, clicking the arrow next to the Calendar you want to display, and clicking on Calendar Settings. The Google Calendar ID is located near the bottom of the box under “Calendar Address.” By default, your ID will be private. Once this is changed, you can return to your presentation and update the address with your public address. Anything you add to your calendar will display on your digital signage--there’s no need to update your presentation everytime you add a date. All that’s left is to update the text and replace it with your content. Click the placeholders, add what you want it to say, and you are all set--less than five minutes! Once it’s done, you’ll have something original like the digital signage I did below. If you’ve used our digital signage software, we’d love to hear how it turned out. If you don’t see any templates that would be useful to you, we welcome your feedback as well. You can contact us here.